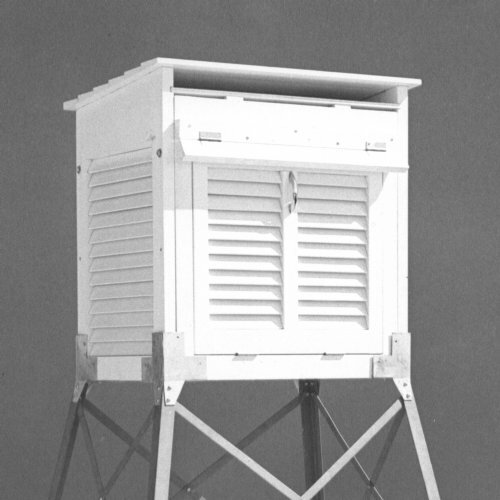 The 380-605 Large Instrument Shelter is built to National Weather Service standards. It is sometimes called a Cotton Region Shelter. The enclosure is large enough to house several recording instruments, such as hygrothermographs. Thermometers and sensor probes can be mounted on a board which spans the inside of the box. 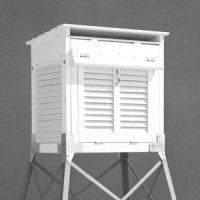 The shelter is constructed of clear pine and painted with three coats of white latex paint. It has louvers on all four sides and vents in the bottom to provide natural ventilation while excluding solar radiation and precipitation, allowing ambient conditions to exist inside. A double roof provides added protection against direct solar radiation. A lock and key are included for security. Optional metal legs are available. For best results, shelter should be installed over short grass. Legs should be anchored to prevent overturning of the shelter in high winds. Shipped partially assembled, the shelter can be assembled easily in approximately 30 minutes.